Eastbourne United manager Simon Rowland has ramped up the pressure on rivals Eastbourne Town ahead of the clash between the two sides in Sussex Division One on Saturday. Rowland insists the game is must win for promotion hopefuls Town and says anything but a win is unacceptable for John Lambert’s side. “This game is all about them,” he said. “They have to win it. Teams in this league have a budget and with the money that they’ve thrown at it, you have to win the league. Town are widely accepted to have one of the league’s bigger budgets and Lambert admits that brings a certain amount of pressure. But he has been on the other side of it at clubs like Sidley, where there was almost no budget whatsoever to speak of. Lambert has used the money at his disposal this season wisely to bring in players accustomed to winning things, with experience at a higher level. “This year I’ve got a budget and it’s not a bad one,” Lambert said. “The club have entrusted me to get them back into the Ryman League and that is exactly what we’re striving for. “To a certain degree Simon is right. They’ve got nothing to lose and form goes out of the way on derby day. We’ve watched them , we should beat them and I expect to but I’ve played in derbies and I’ve managed in them and anything can happen. “They will raise their game by 50 or 60 per cent and they will want to beat us badly. It will be Town’s first competitive game inmore than two weeks after a host of league games fell foul to the recent weather. They have lost ground in the title race as a result and Lambert is keen to get their promotion bid back on track with a win. 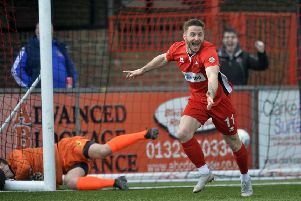 Having been top of the tree for large parts of the season they are now fourth and eight points behind leaders Dorking Wanderers. However, they do have three games in hand and will go back to the top if they can win all of them. Kick off is 3pm at the Saffrons, Saturday December 27.